The Capitol design features 17 different types of marble. Much of the marble came from other countries. There is one remaining “office” sink in the Capitol. Historians are unsure why the one sink remains. In the late 1800s it was common for government offices to have sinks and sometimes even baths, due to long and dusty travel conditions. The Capitol is the tallest building in Topeka. It’s not a city ordinance, but a taller building has never been approved. 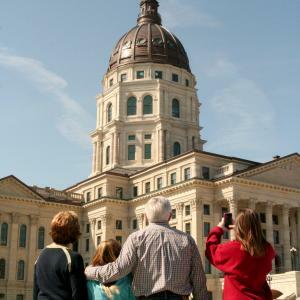 The Kansas Capitol is the second tallest, out of 38, traditional dome Capitols in the United States. The Capitol will tarnish (and turn green again) in 30-40 years. When the Capitol was finished in 1903, after 37 years of construction, there was no debt on the building. The oldest book in the State Library, inside the Capitol, is from 1741 and written by Sir Francis Bacon. Our Digital Marketing team is busy Topeka-caching #TopCity news, events, lists and more! Follow us on Facebook and sign-up for our newsletter to keep up!